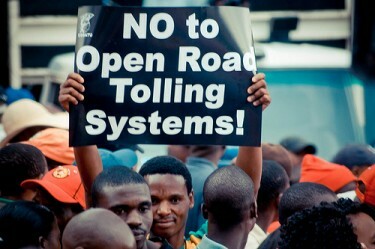 Despite public outcry, legal challenges and protest actions from unions such as COSATU (Congress of South African Trade Unions), Urban Road e-tolling is set to go ahead in Gauteng on 30 April, 2012. Electronic Toll (e-toll) is a cashless payment system for road used by road operators to pay toll fees. E-Tolls in Gauteng are the first open road tolling system in South Africa, and will be used to service a 20 billion rand debt as part of the GFIP (Gauteng Freeway Improvement Project). OUTA (Opposition to Urband Tolling Alliance), a group of Unions, Associations & Businesses have also lodged a court case to seek an interdict against implementation of E-tolling, with the Judge ruling that the matter was urgent. 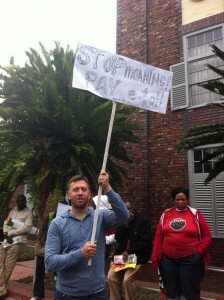 South Africans protesting against e-toll. Image courtesy of Flickr user SiyaAfrika. Outside the court, there was also a single lone supporter of E-tolls who tried to disrupt an ongoing protest. A one supporter of E-tolls outside a Johannersburg court. 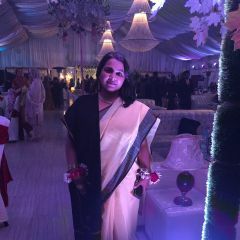 Image courtesy of @GiaNicolaides. SANRAL (South African National Roads Agency) argues that E-tolls are an effective way to fund road improvements, and works on a User Pay principal. 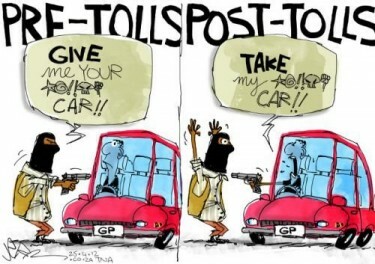 Arguments against e-tolling focus on how ineffective it is, since a large portion of the money collected will be spent on administration and collecting the toll fee. COSATU previously held a protest on the 7th of March. The labour union has also planned a Protest & Blocking of roads on the 30th of April, with a mass stay away planned for May. One YouTube user posted a video of the incident which now seems to be a stunt or prank. “the world’s most expensive toll collection system”. He said it would cost over R1bn a year just to collect the fees. Putting it plain and simple. Etolling of our roads is absolute hogwash, especially the M1 in Johannesburg. Its illegal and all the corporate politics associated to make further money out of public is crap. Bullying tactics of SANRAL and our government have failed so far, and hopefully continue to fail for as long as possible. And strangely they also indicate you last “transactions” for the e-toll, which on my account showed i passes a bridge at 5:21, even though i only wake up at 6. So Sanral [South African National Roads Agency] has a lot to fix before getting this to work. As Cosatu general secretary, Zwelinzima Vavi, has pointed out, without cheap, efficient public transport, road tolls will raise the cost of living for everyone in South Africa. This situation is exacerbated by the recent increase in the road tax and fuel levies and the consequent rise in fuel prices and transport costs. paying toll for the roads built as part of the Gauteng Freeway Improvement Project (GFIP) is nothing more than double taxation to pay for government’s mistakes. We all know that infrastructure isn’t free! It costs money to build and most thinking people don’t mind paying for it. What the vast majority is up in arms against is having to pay for the infrastructure twice!! E-tolling is the most effective way of collecting this money. I am not debating whether we are getting a good deal from our current service provider. It appears that our Austrian friends have done a great job of negotiating themselves a sweetheart deal and Sanral would be well advised to renegotiate this contract in short order. However, increased fuel levies or special taxes on license fees are all less than optimal ways of ensuring that the roads get paid for. Sanral needs a direct way of collecting money without the treasury getting in the way. Personally, I think its total madness and those who say improved/better roads are blind sighted. Is that not why we pay tax and are there not enough tolls already?! If the E tolling goes ahead its going to have a major impact on the economy. Prices of things are going to go sky high. Is petrol price and water and electricity not high enough already?! On Twitter, netizens also voiced their opposition using the hashtag #etolls. @deliaVipond: Bought my #eTolls tags going to register them at the etoll customer care office at Cedar Square today! Sorry not boycotting! @Renee_Burton: Imagine this much effort around etolls-what abt the other pressing issues that plague our societies daily,unemployment,poverty, corruption! 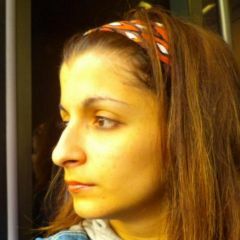 @mike_said_what: #SANRALSongs Get off the road Jack and don't you come back no more no more no more no more!